Now that I finally have a HOTAS and the Tobii is working, DCS is a totally different animal. Much more enjoyable and immersive. I did a group flight with about a dozen folks going after the Kutzenov and it was a ton of fun. First in the F-15C and then in a MIG-29. Folks told me just to use F10, but is there a way to set my own waypoints and use that method? Why did my radar only sometimes work? I’ve noticed in training that sometimes contacts come in loud and clear on the radar and I can lock them up. Other times I see a bomber, can get a visual on the contrail, and the radar screen is clear. How do you keep spatially oriented? What’s a good “starter” campaign? I’d like some continuity and also a set of tasks that is progressively more difficult. A good deal of content seems to assume a higher level of familiarity than I have. Howdy, cheers on rediscovering DCS. Let’s take a stab at your Q’s then. F-10 map, looking outside (left at the lake shaped like a dog) and using your flight plan. Some of the planes can create waypoints in-flight such as the F/A-18 and the A-10C. It’s a hassle though. Given flight plan should be sufficient. The radar has a limited volume it scans. Think of it like a pie wedge, with the pointy bit at the radar dish itself It’s a flat shape because the radar can only look up so much. In certain radars, such as the F/A-18’s you can set the search parameters yourself in order to find them where you suspect them to be. So elevate your search volume up if you don’t see the bomber on radar that you can see contrailing out in the distance. Experience. And lots of it. Analyse your flights using a tool named Tacview. Keep at it. Pattern work around the airfield is a good starting point. Carefully move up to 1v1, 2v2 etc. It’s the fighter pilots’ second most important skill (the most important one is G tolerance) so don’t worry if it doesn’t come easily or quickly. It takes years to really get good at. You might want to give the “ultimate argument” Su-27 one a go. I found “Museum Relic” also really good and not terribly hard. That one is for either MiG-15 or F-86. Those crates have no radar or other confusing gizmo’s. Just an engine, wings and guns. Campaigns are a great way of gaining that higher level of familiarity, but the baseline you must gain from the interactive training missions and small exercise scenario’s you cook up in the mission editor. I exercise basic fighter manouvering almost daily. Just a quick 1v1, 2v2 fight either on heaters/guns or guns-only. Been doing that for years. And I am still only mediocre at best when it comes to situational awareness and BFM. 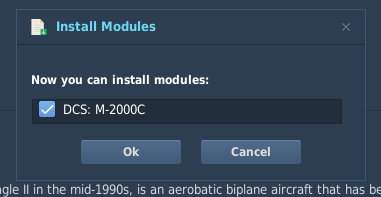 Also, as an additional point, it seems like the navigation system in the MiG-29 is currently broken, so in the meantime, for that one it is in fact easier to use the F10 map. I would like to reiterate everything said previously about practice and TacView. The way you get better is through repetition, but you want to make sure you’re practicing the right things (hence TacView). Practice doesn’t make perfect; perfect practice makes perfect! What I say next may seem counterintuitive, but instead of FC3 birds I recommend the Mirage 2000C as a starter module. It is fly-by-wire (forgiving and good for learning the basics without chasing the instruments), has a great autopilot system, and while it’s a full-click cockpit the systems are simple enough and most switches can be “set and forget.” The INS also does allow you to input waypoints on your own, unlike the FC3 birds. In addition, the campaign that ships with the Mirage is outstanding. It is both a training campaign and a campaign that keeps you on your toes to force good airmanship. I had my eyes on the Viggen next but I’ll look at Mirage instead. All in all it’s cool to have a game with meat and complexity to it, lots to work on. I heartily second this recommendation. It is excellent indeed. Mirage is far easier to get into and do cool things with than Viggen. It’s also really pretty! 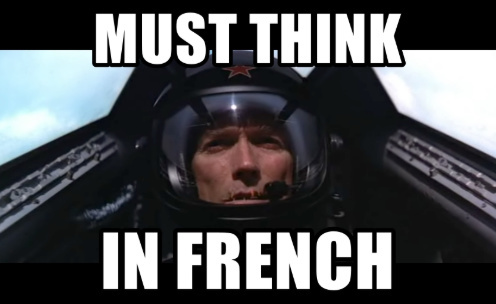 Oh la baguette is a rocket ship. Tons of power. If only it carried more sticks. It would be perfect. Compass coupled with visual features at a minimum, F10 view if really demanded. Some aircraft like F-14, F/A-18, AV-8 have good navigation features so there’s not much reason to use the F10 view. Some aircraft can drop a waypoint in the navigation system if you have the coordinates, but it can be hard with some (F-14) and impossible with others (all FC aircraft). In this instance, the contact is usually in the radar’s notch. That is, the radar can’t differentiate between the target and stationary features like the ground. Typical cases are target moving away from you at a certain speed range or moving laterally to the radar’s scan volume. Some radars like the F-14’s are especially suspect to being notched. Can you break this one down some more? Do you mean how do you keep track of who’s who in a fight or where you are relative to the action? Generally speaking, I try to coordinate with my wingman and break down targets so everyone has an assigned target and they’re following it. If anyone loses their target or can’t find it, I try to maintain what I’m currently tracking while looking for the other. Unless there’s an immediate threat to me, I try to ensure my wingman is still actively searching while I focus on my part. It’s a bad idea to enter a fight outnumbered, even against more inferior opponents. The best thing to do in such actions is to stay calm and relaxed because getting exciting or panicked will lead to making mistakes that your opponent(s) will exploit. Can’t answer this one as I mostly focus on single missions and multiplayer. The Viggen is a fast strike/anti-ship aircraft, not a dogfighter. If low level, high speed, pump n’ dump is your game, then it’s a fun aircraft. If it isn’t, then other options are better suited. Keep in mind that the Mirage is technically an interceptor, and while I find it an excellent dogfighter, it can’t match the overall capability of the F/A-18 in that region. It also has a picky INS that takes 8 minutes to align from a cold start as well as a French cockpit that can be jarring to get into. It goes fast and does that well; as soon as things start getting slow, it has problems – especially in landing! But to help with that la baguette has the most exquisitely designed landing HUD in all of DCS. Naw man. You can fix that. Aint harder than trying to put a hog down in fog. I’ve gone without thus far, just miss the drag chute on occasion. Il faut penser en Francais. I just flew the 2nd NTTR training mission for the baguette (I’m gearing up to do the red flag mirage campaign) where you get to fiddle with the INS some more. You can input waypoints and glideslope/runway headings in it. So yeah, diverts should not be a problem, @Franze! That engine… And FBW, hooning around in that thing is so easy and hoony POWERRRRRR!!! I just flew in at 150 feet and mach 1.2 at Creech. Pulled it vertical right over the runway. Went up to 20k feet and chopped the throttle. spiraled down at 15 units of AoA keeping it at 170knots or so. Split-S’ed from 7500 feet, added a little power to lessen the AoA and just carefully kissed the tarmac at 150 knots and about 8 units of AoA which is just how it likes it. I really, REALLY wish the gentlemen who did the Bill et John videos were still around, or the guys who did Banksy et Mutch were still around to do something with Mademoiselle la Mirage. So the Mirage is pretty awesome! I’ve got a few flights under my belt but I’ve spent most of the time setting up my keybinds. It’s so much smoother than the F-15C.